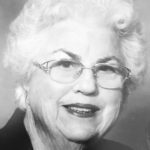 DWIGHT – Margaret J. Rhode, 88, of Dwight passed away at 7:30 a.m., Tuesday, May 1, 2018 at Evenglow Inn, Pontiac. Margaret was born February 16, 1930 in Chicago, a daughter of David and Mary Gaffney Moran. She married John A. Rhode November 15, 1952. He passed away March 16, 2012. She is survived by her sons: John Patrick (Margie) Rhode, James Rhode, Thomas (Teresa) Rhode, and Michael (Rhonda) Rhode; and nine grandchildren: Meghan, Holly, Patrick and James Anthony Rhode; Benjamin, Daniel and John Paul Rhode; and Griffin and Leah Rhode. She was also preceded in death by her parents; one brother, Daniel Moran; and one daughter, Mary Mar-garet Rhode. Margaret led a beautiful and full life, and will be missed for her love of music, cards, laughter, energy, and optimism, but when God called, she answered quietly and peacefully. A Mass of Christian Burial was Monday, May 7, at 10 a.m., in St. Patrick Catholic Church, Dwight, with Father Chris Haake officiating. Burial followed the Mass on Monday in Mt. Olivet Cemetery, Dwight. Visitation was held from 2 until 5 p.m., Sunday, May 6, at Hager Memorial Home, Dwight. The rosary was recited at 5 p.m.